As part of the ongoing Environment Partnership Award there is a community clean up at Macosquin on Saturday 3rd December. Scouts and Explorers (and parents who wish to help) should meet at the Scout Hall at 10am. You should be back by 1-1.30pm. Come in old clothes, boots or wellies and waterproof coats. These clean ups are organised with local community groups and the PSNI community officers. The more people that come along the quicker the morning goes. 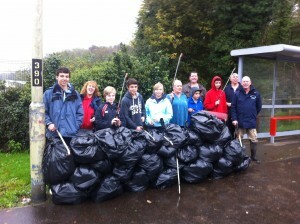 The recent clean up at Greenmount in Coleraine was very effective with a wall of black bags being created! This activity also counts towards the Community Challenge Award for Scouts and Millennium Volunteer hours for Explorers, it can also be used towards DoE and Explorer Chief Scout Awards for volunteering.